I love the handcrafted, unique and cool things that eco-artware carry in their online store. Baskets made from recycled chopsticks, coasters made from old records, and cute stuffed animals made from recycled sweaters. They have recently added organic terrycloth bath mits. This cute Solar Polar Cub hand mitten is going to be a hit with my kids. One more thing to make bath time even more fun. Bath time is fun. My kids love the water. My daughter is 10 and often takes a shower now but she still asks to take a bath…just so she can play in the water. My almost three year old adores bath time. He can be in the middle of a supreme melt down but if you ask him if he wants t take a bath, he’s all smiles. Bath mittens are so cute, like puppets for the tub. 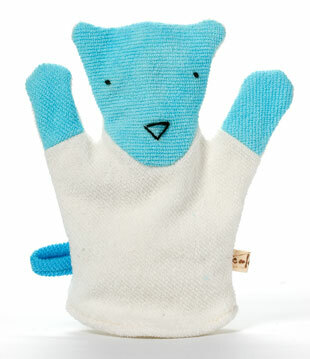 And eco-artware’s new polar cub is made from hand dyed, organic French terrycloth and sewed with organic thread. This is something crafted with care to be nothing but eco-friendly by textile artist Suzanne Lappan. The polar cub is new so maybe the artist will add more styles because they are adorable. I wish the mitts came in a monkey style.